Well, kinda.... I'm moving my content over to a different service. I have some long-term goals as it relates to writing, and I'll get a much better community in my "new place." I'll post a link here after Ive launched with the new host- and all my archives will he there. If you have any favorite recipes, trip reviews, or personal ramblings, they'll all be there. Truth be told, I would have never even heard of Pingxi had it not been for a friend who had already scheduled a trip there. Heck, Taiwan even hadn't made my "must see" list. I'm so glad I went. Taipei is a cool city with a very distinct personality. Even though it is commonly lumped in with China, Taiwan has it's own distinct vibe. Taipei was surprisingly clean and had an extremely user-friendly metro system. 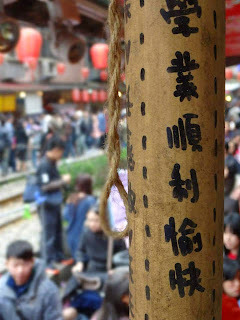 It was an easy hop up to the Beitou Hot Springs and Yangmingshan National Park. 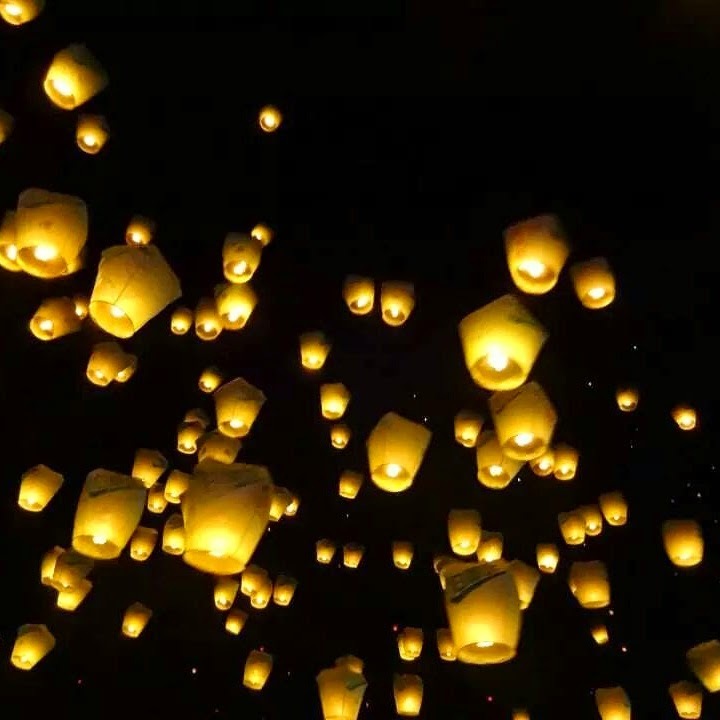 The main reason my friend had picked Taiwan was to check out the Pingxi Lantern Festival in the Pingxi District, about 15 miles east of Taipei. Because of the festival, we were ale to pick up a shuttle directly to Pingxi from the Taipei Zoo; the trip took about 45 minutes. I feel a little hokey saying that the area was charming... but it totally was! The Keelung river runs through Pingxi, and there were a few cool bridges that spanned it's width. To add to the charm, the main area is packed with shops and restaurants and, get this, there are rail tracks that run through the middle. If a small river, cool bridges, and a cute town square with rail tracks doesn't make you feel the travelfeels... then I don't know what will! There were lanterns strung up everywhere and there were a handful of stations where festival-goers could decorate a giant lantern and send it up. This activity was wildly popular, so there was a bit of a wait, but we really had nothing but time, so it was worth the wait. Conveniently, there were four of us, so we each took a side and wrote wishes for the new year. We wandered around waiting for it to get dark. The train that ran through town also chugged on up to the Shifen Waterfall, and it appeared that many people headed up there to kill some time before sunset. We weren't prepared for handling slippery rocks or any real physical activity so we opted to stay in town. When it got dark got in line; they had people sectioned off into groups of probably 200. We inched towards the field where the lantern release would take place and there was a large stage with entertainment... except it was all in Mandarin. We happened to be the in on-deck corral when a huge blow up lantern near the stage started to collapse on the crowd. It wasn't dangerous, so I didn't feel bad laughing a little bit. For the release, we were handed a folded lantern and told open it up and each of us hold a top corner. 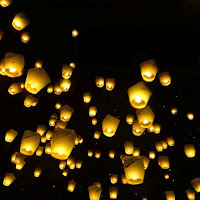 An event worker came over to our group and lit the lantern, we counted down, and let it go. It was really cool to see so many go up at the same time. It was one thing to see the releases prior to ours, but seeing it up close was really spectacular. It didn't take long before most of them were completely out of view. I was a little surprised that they didn't really interfere with each other... some bumped or crashed and burned, but most of them had a smooth ride. Overall Pingxi was a really cool place to visit, but you'll get more action and activity if you plan a trip during the Lantern Festival. It was one of the cooler festivals I've been to in Asia, as it wasn't such a massive backpacker destination that it felt fluffed-up just to increase tourism. There were tons of Taiwanese with a handful of foreigners. Even if you're on the fence about Taiwan; the Pingxi Lantern Festival paired with the cool vibe of Taipei, the beautiful national parks, and the beachy areas down south; you definitely won't be bored! Do you have any world festivals you've enjoyed and recommend? Yesterday I was flipping through the coupon booklets that come in the mail and noticed a Ben & Jerry's coupon for $1 off. Score! To make the deal even sweeter, Stop & Shop had it on sale s for $5! This was a deal I couldn't pass up! I'm less likely to eat too much ice cream when its in the house. Backwards, I know. Whenever I go out to grab ice cream from a local place, I always want to waffle cone- which comes with a ton of ice cream. If I have it at home, I can usually keep myself to 1-2 scoops worth. This helps me keep the calories and the cost at bay (regular $2.99 for a pint vs. $4.50 for a waffle cone w/ 3 scoops). 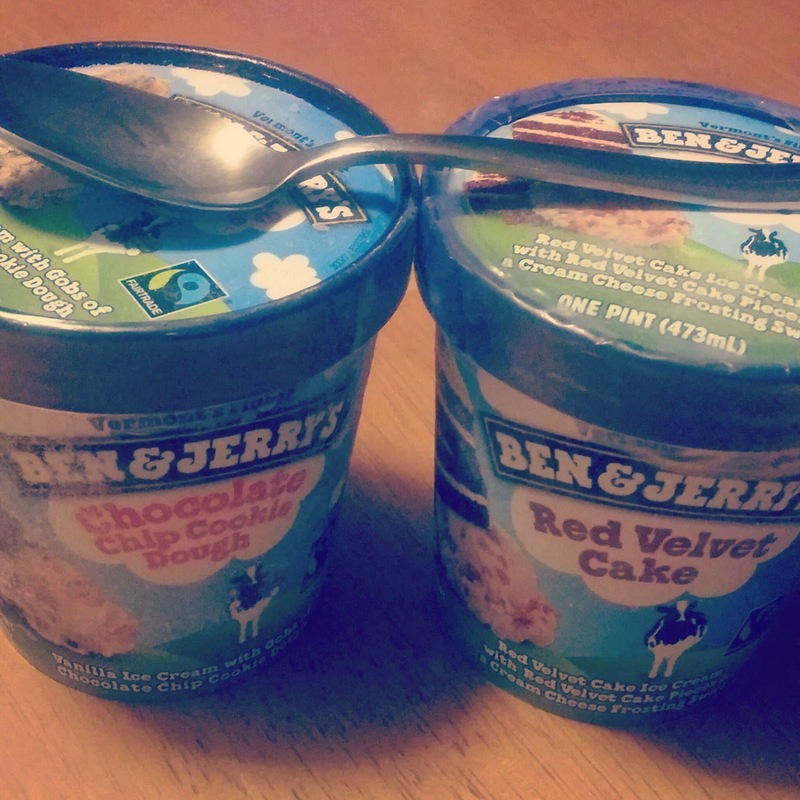 I like Ben & Jerry's; as far as ice cream from the grocery store goes, I think they're the best. I like frozen yogurt and gelato, too-- but I'm most likely to reach for ice cream. I grabbed a Chocolate Chip Cookie Dough and a Red Velvet Cake. Each section has a short description of how they've dedicated themselves to each initiative. Definitely worth a look. In the end, ice cream is still ice cream and eating copious amounts of it would likely have a negative impact on your health. However, in my opinion, Ben & Jerry's is a brand I can reach for and feel good about. The ice cream tastes good, its juuust expensive enough that I need to make it last (and won't likely binge), and they have have a pretty sound business model. What other brands have you encountered that are socially conscious? I've seen several versions of this photo floating around on my social media recently. Over the past few weeks, it has popped up on my Facebook feed, Instagram feed, and on the "photos you may like" area on my Instagram. I take issue with this sentiment. I get that it is meant to be used as a form of motivation; but I find it to be rude, exclusive, and generally wrong. To top it off, 5 out of the 6 photos I've seen (all have slightly different images with the same quote) have a little Crossfit logo on it somewhere. Just another reason why I don't think Crossfit is for me. I've read up on it a fair bit, and think that it could potentially be an ok way of exercising- depending heavily on your physical ability. It has taken a lot of flack over the past year or two; some of it warranted, and some not. I've read horror stories about injuries that shouldn't have happened because the "trainer" didn't know what he/she was talking about and pushed an individual too far beyond their physical capabilities. No bueno. However, I do know that there is now a more rigorous educational program for Crossfit trainers and the National Academy of Sports Medicine (NASM)- a leader in the personal training education/certification field- has added a Crossfit option to their program list. Great steps in the right direction. I totally agree that exercise programs that offer a sense of community foster a much higher success rate than comparable solo programs. And it can be a great way of making friends. Also, I have a few exercise science friends (ranging from kinesiology majors all the way up to physical therapists with their PhD) who really enjoy Crossfit. I trust that if health/physiology/body-movement professionals are ok with it, then it must be safe. Crossfit is still in it's fad stage, and seems to perpetuate the thought that "if you're not doing Crossfit, you're exercising wrong." I understand that this is not the mentality of every Crossfitter, and they have the right to be proud of their progress and share it with the world however they like. BUT making me feel bad or lazy because I'm not "dedicated" is a dangerous line to walk. Yes, there are a lot of Crossfitters that are walking the line between dedication and obsession- and they don't even know it. Let's look at the clinical definition of obsession: "Compulsive preoccupation with an idea or an unwanted feeling or emotion, often accompanied by symptoms of anxiety; or a compulsive, often unreasonable idea or emotion." 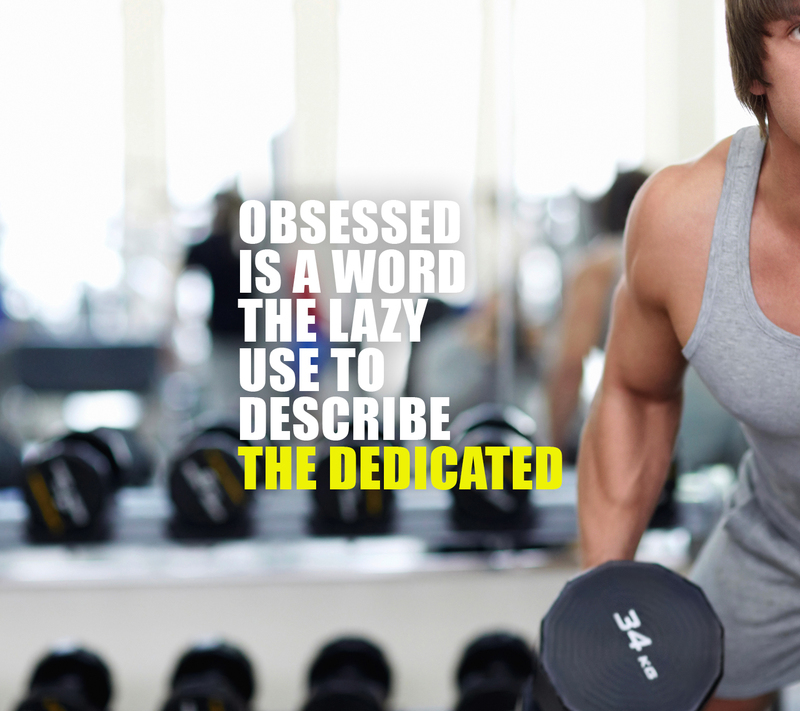 When it comes to health and weight management, obsession is absolutely something people need to be aware of. I do agree that, yeah, sometimes people who are lazy or unmotivated will try to chip away at people who have the life/motivation they wish they had-- and maybe "obsessed" is one of the digs they use. In this case, calling someone out on being obsessed, may actually be calling a spade a spade. Especially when it comes to health-related fads like diets, exercise routines, and supplements; we need to keep an eye out for obsessive behavior. Sometimes, calling someone obsessed is a way of trying to break them down, but sometimes it is pointing out an actual issue that needs to be dealt with. Let's look at one of the implied messages behind these words: if you're not doing it this way, you must be lazy. Ok, so that might be a little dramatic. Especially with the versions of this photo with the Crossfit logo, it makes me feel like the person posting feels that just because I lack the obvious motivation that Crossfitters have tapped into, then I must be lazy. I understand that is not likely how it was meant to be interpreted, but that was the first though that came to mind the first time I saw the image and phrase together. I can't do high intensity cardio or lift heavy weights. I know my body and know my limits pretty well. With a deviated septum and bursitis-riddled joints, Crossfit will likely never be a good choice for me. I just can't get enough oxygen to my muscles to do that Crossfitters do. It's the same reason I'll probably never be able to run a marathon or be a great swimmer. These factors don't make me lazy. Just because I'm not as motivated, or am motivated differently, and may express some concern with the weirdly long hours someone is putting in at the (any) gym-- doesn't mean that I'm lazy. I feel like there must be a kinder, more accurate way of calling yourself motivated without (accidentally) calling someone else lazy. It just doesn't feel like a nice thing to say, ya know? Motivation comes in a lot of forms, and I am not motivated to try Crossfit. If someone were to invite me to a free "bring a non-believer to Crossfit" day- I would LOVE to go and see what it's about- but I am not about to hunt it down and join a gym. What experiences have you had with Crossfit? What am I misunderstanding here? Is there any information about Crossfit that I have gotten wrong? I ate seaweed regularly in Korea. It was often served, in various forms, as a side dish at restaurants. There was one restaurant, affectionately referred to as "Soup Tent" that would usually serve it with our food- and if they had run out, we would elect someone to go to the nearest mart and buy some. It was that important to the meal. My sweet Job Lot find. I've seen it sold in a few Asian specialty stores, but it is usually way too expensive for me to even think of buying any. It's hard to justify spending $12 on a product that you spent years paying $7 for- even if it's imported. Today, I stumbled into some at Job Lot- $2 for 5 packs- not bad! 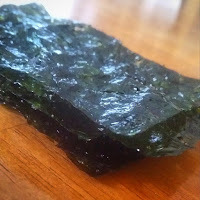 →Seaweed contains Vitamin A, Vitamin C, and Calcium. However, given the common serving sizes, it would be difficult to derive sufficient amount of those nutrients. 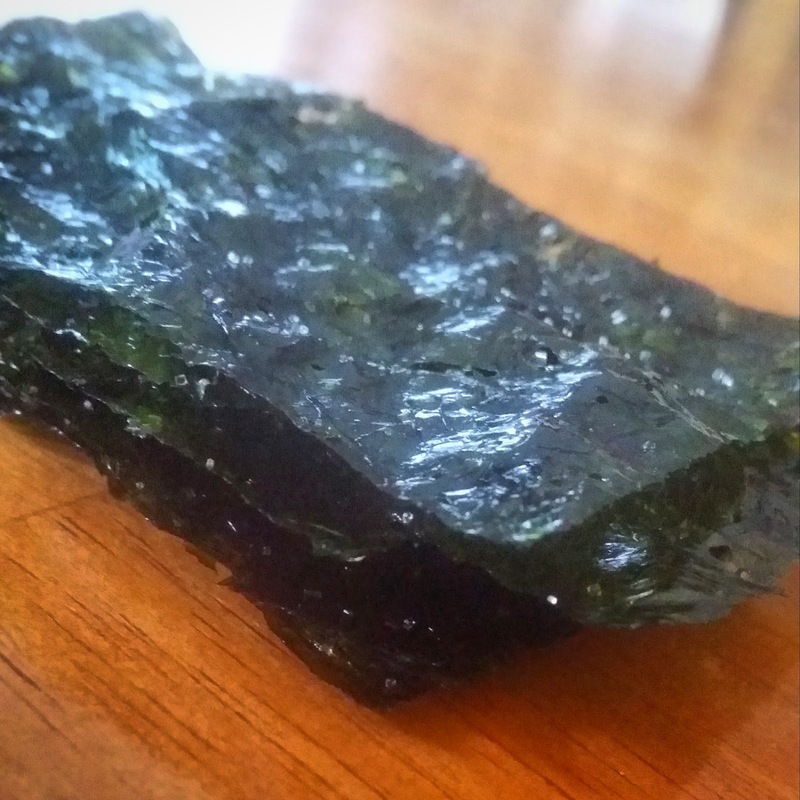 →Seaweed does contain a rare mineral that is missing from many other foods: iodine. →Iodine is crucial in maintaining a healthy thyroid (a gland in the neck with the difficult job of maintaining healthy hormone levels in the body). →Even mild iodine deficiency can be problematic. The issue manifests subtly; causing issues like fatigue, depression, susceptibility to disease, and inability to lose weight. →Seaweed is a great source of antioxidants. →Not all seaweed is created equal. There are many varieties that are treated in several different ways. For example, there is a variety of red seaweed that in 10 grams, offers 34 times the amount of potassium than that of a similarly portioned serving of banana. Potassium is important, but too much can have a dangerous effect on your kidneys. Just be careful and know what type you're eating and adjust accordingly. →The chemical composition of seaweed is fairly close to that of human blood plasma! That makes seaweed a great at regulating and purifying our blood. What are some creative ways you've used seaweed? One of the best parts of arriving in a new place is exploring the local markets. Because I get really excited about all the new and interesting produce options, checking out the markets is usually one of my top priorities on my first day exploring. Yeosu had some awesome markets that had a combination of produce, meats, and small restaurants/food stalls. Open air markets are usually a good indicator that there is a strong local farm scene. For example, my "fruit ajjuma" (the old lady I bought my fruit from), only grew some of her produce and the rese, based on the season was outsourced to farms outside the city or in other areas in Korea (I noticed nothing imported). However, my "vegetable ajjuma" grew all her carrots, peppers, cucumbers, and different lettuces in her small city garden. So far, I think my favorite market has to be the one in Hoi An, Vietnam. The Central Market is down by the riverfront and has, what I can only describe as "epic amounts of interesting stuff." Some of the produce I had never seen before, which of course prompted me to buy! There are so many different types of fruits and vegetables out there that we aren't exposed to in North America; and if we are, it likely isn't nearly as fresh. If you've ever seen an heirloom tomato, you're familiar with the concept of ugly produce. That is how it was intended to be. I particularly like the Central Market in Hoi An because at this point in my life, I was really missing things like avocados and limes-- rare and/or expensive in Korea. They had so many of both- and my favorite fruit that I can never see to find- dragon fruit. While I was there, I made sure to snag some goodies: a dragon fruit, a few lychee, and a green orange. I usually pick out one really diverse table, so I can ask a lot of questions, potentially buy a few things, and maybe get a good deal. Also, keeping an eye out for hawkers who are handing out samples is something I do, too. I realize this might not be the most coherent post, but I've had a long day staring at, and editing a really huge Excel file. Brain = fried! 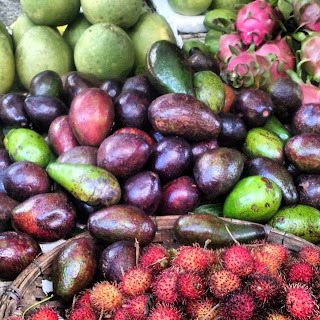 Do you have any favorite foreign fruits or veggies?